Event registration closed on Monday, 3/23 at 9:00 AM. Due to building security at the event venue, no walk-in registrations will be permitted. The event registration is now closed. Due to security reasons, no walk-in registrations will be permitted. 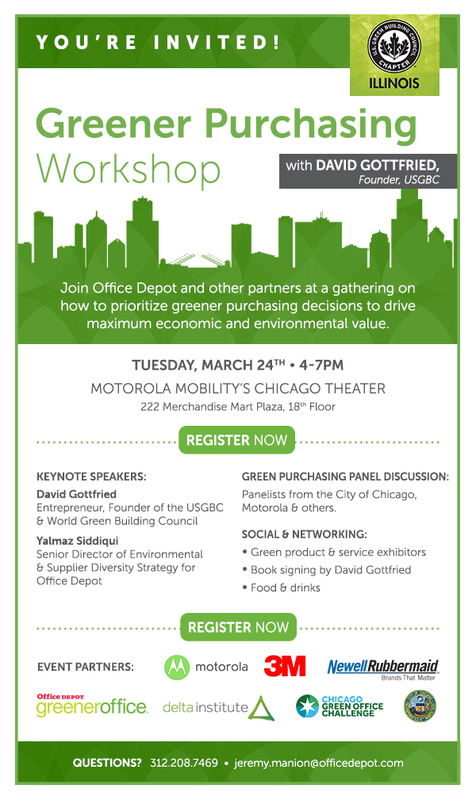 Join USGBC-Illinois, Delta Institute and Office Depot for a Greener Purchasing Workshop with David Gottfried, Founder of the U.S. Green Building Council. Audience: This program is ideal for office managers, procurement professionals, facility managers, building managers and all those involved in sustainable operations decisions and implementation. Registration: Free! Capacity is limited, so register soon. Registration will close 48 prior to the event on Sunday, March 22. If you are a member of the press, please register by March 17.